Do you know any kids who love fairies? I do – I know two of them. 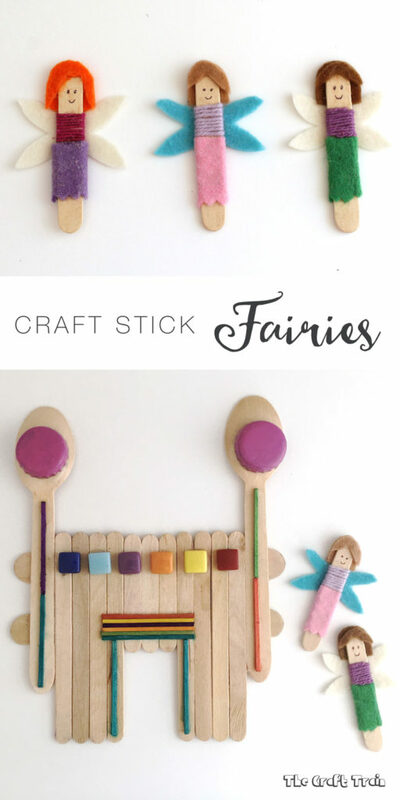 This is why I’m posting a series of easy fairy crafts for kids over the next month or two, so welcome to our first post in the series. 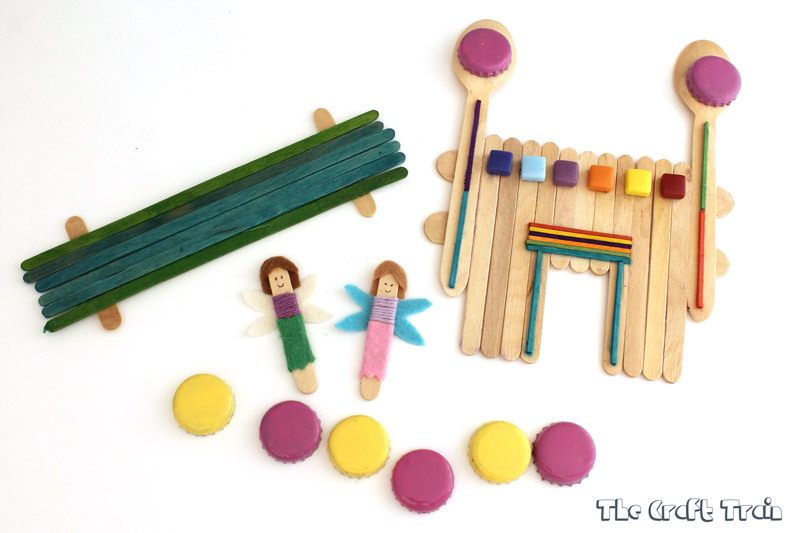 Today I’m sharing a simple craft stick castle complete with mini craft stick fairies. On it’s own this is a fun DIY toy and my daughter was playing with hers just like this on the carpet for quite a while, but next week I’m going to show you how we’ve put these pieces together into a small world fairy garden which kids can help to make. It’s a fun and creative project for all ages. If you’re anything like me you have a collection of craft sticks in different shapes and sizes already in your craft supply cupboard, along with other bits and pieces. I didn’t even know I had coloured tooth picks but found some at the back of the cupboard when I was pulling out the craft sticks (one of many impulse craft purchases crowding out my storage space), and the wooden spoons are something I used recently to make a funny spoon gecko and also these rainbow magic fairy ornaments at Christmas time last year. 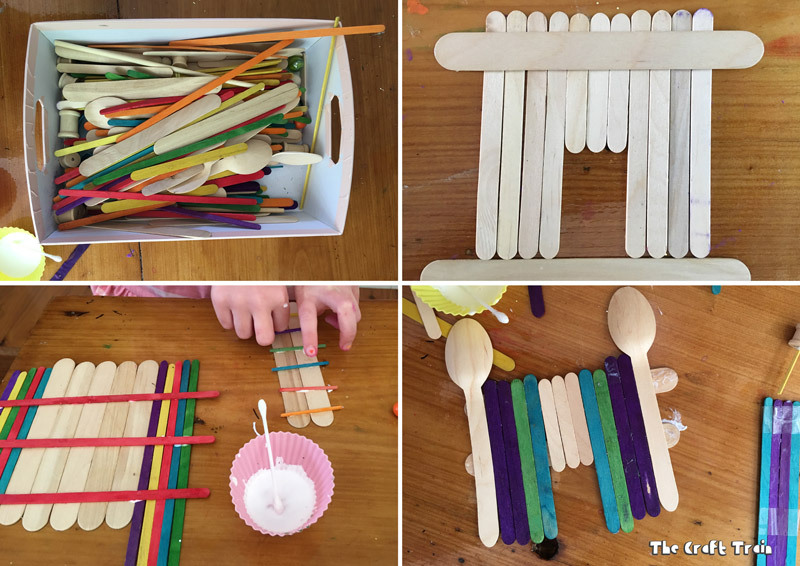 To make the castle, lay out the combination of craft sticks so it has long pieces at the end and short pieces in the middle. You can use the edge of a long craft stick to line up the craft sticks which make up the wall so that the bottom edge sits straight along the ground. Glue two long craft sticks across the top of them to hold them in place. 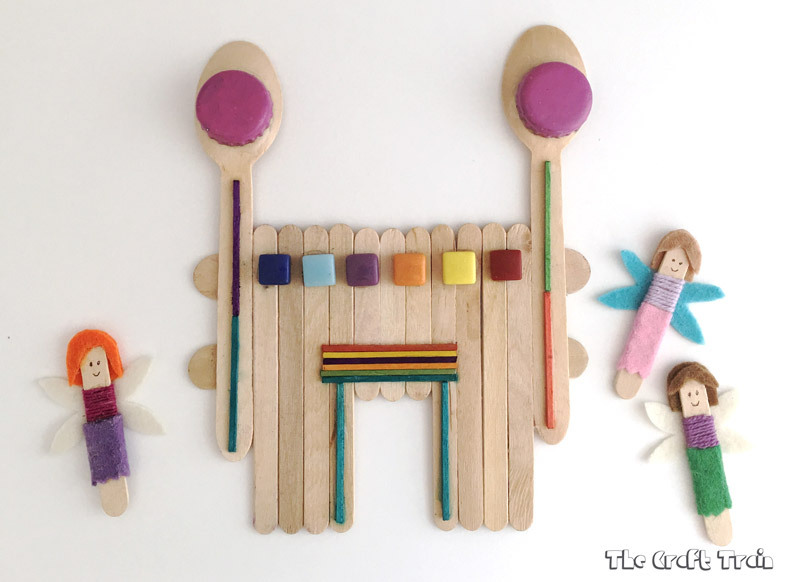 Add a wooden teaspoon on each end to create turrets, or use longer craft sticks instead. You can see in the image above the two different castles my kids created and also the little bridges that we’ll be adding to our small worlds when we make them. 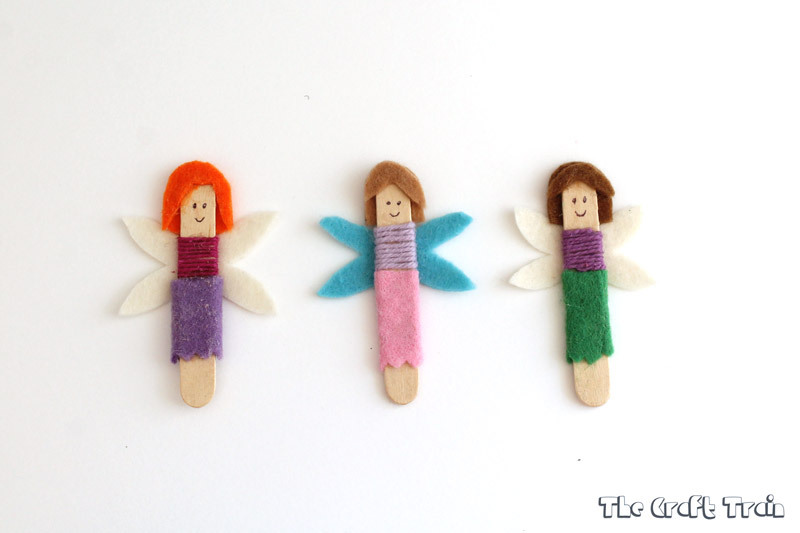 To make the fairies cut a small square from one of your felt scraps and glue it around the middle of your mini craft stick to create a skirt. Glue some yarn on for the top by wrapping it around and around just above the skirt. To make the hair I used two pieces of felt, one for the back of the hair and a fringe-sized piece for the front. Glue these on and finally draw a face with your ball point pen. Easy! Of course, one fairy by herself will get a bit lonely so she’s going to need a friend or two. This is the completed set of decorations which I’ll be using in my fairy garden. We’ve also added a coat of DIY mod podge (water mixed with PVA glue at a 50:50 ratio) to the outside of the wood to help make it a bit more weather proof since our gardens are going to be kept outdoors. My kids love the castles they have made. Remember to check back in next week to see the small world gardens we are making for our fairies to live in, or you can sign up for our newsletter using the box provided in our sidebar. We also have a specially dedicated fairies board on Pinterest. 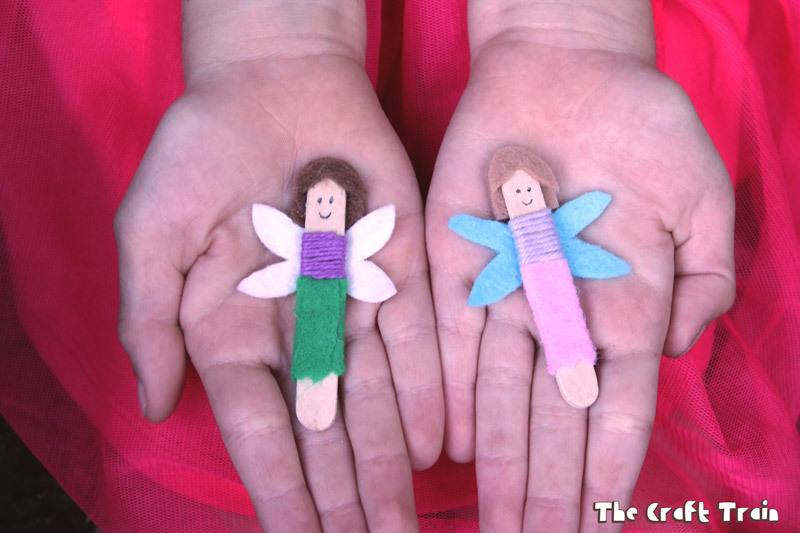 There are so many lovely fairy crafts out there which will inspire you to get creative at home! If you loved this spread the word. Use our easy sharing buttons at the end of this post.